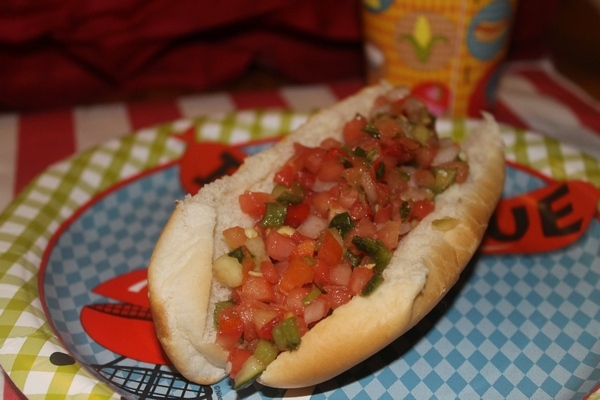 Get Grilling with Bar-S & Enjoy a Hot Salsa Dog Recipe! This post brought to you by Bar-S Foods. All opinions are 100% mine. Grilling is one of our favorite ways to dine during the summer. Whether it’s just me, my mom and Jake enjoying tasty plain Bar-S Turkey Dogs or a whole family gathering, nothing quite says summer like a barbecue. My favorite thing about grilling out is that no one is banished to the kitchen for cooking. I remember during winter get togethers, we’d barely see the cook because she’d be locked up in the kitchen prepping everything. 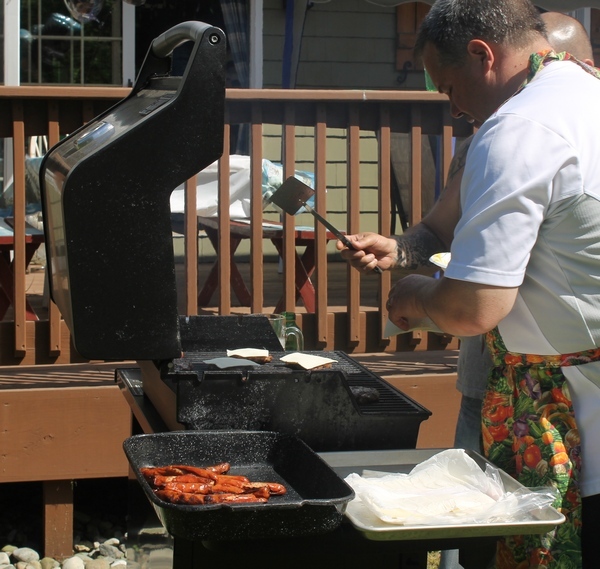 When you grill outside, you’re usually right in the middle of the party! It’s like the aroma of the barbecue just draws everyone in. 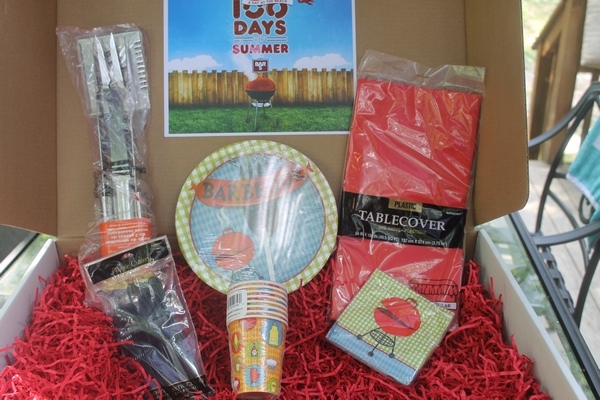 Bar-S sent me a really fun Summer Barbecue package to help celebrate their 100 Day of Summer Sweepstakes. It was just right for a family get together with my boyfriend’s family! While I usually eat my Bar-S Hot Dogs plain, Sal is a lot more adventurous. We came up with this great Hot Salsa Dog idea together! He actually recommended salsa, and I thought it would be more fun to make it hot. You know, hot dog, hot salsa. I’m so punny, aren’t I? Dice the vegetables until they are the consistency you prefer, then mix all ingredients together in a bowl. That’s pretty much it! You can adjust the heat with different spices or, as I mentioned, hotter peppers. The great thing about salsa is that you can pretty much mix it up however you like. I also love putting sweet corn in mine, but no one else in my family likes it that way. To make your hot salsa dog, just grill up your Bar-S hot dogs, pop them on a bun, then spoon the hot salsa over top! Easy, just the way I like my grilling recipes! The great thing about Bar-S is that they make such a great range of grilling products. I only eat turkey or chicken dogs, both of which they offer. Everyone else in my family eats regular hot dogs. Since they’re priced right, everyone can get exactly what they like best without spending a small fortune on the barbecue. They also make bologna, which is one of my son’s favorite foods. While you can’t really grill it, I bet you could wrap it around a hot dog for an interesting experience! I once saw a friend eat a hot dog wrapped in bacon and covered in cheese, so wrapping it in bologna doesn’t seem that far-fetched! Head on over to the Bar-S Facebook page to check out the 100 Days of Summer Sweepstakes! All summer long, they’ll be sharing chances to win great prizes, such as amusement park tickets. There are so many different way to enter, from answering a question to sharing a picture. It’s such a fun sweepstakes! While you’re there, you can also grab a Bar-S Coupon! What are your favorite ways to enjoy your Bar-S hot dogs during grilling season? That hot dog looks delicious! I love those diced tomatoes on top! Grilled hotdogs are the best. In my house I have been known to be standing in snow cooking on my grill. You can’t get that taste with a stove. So mouth watering! That appears to be irresistible! This looks like a hotdog to die for! This looks really good. I would never have thought to put salsa on a hot dog. I will have to try making this home made salsa. This looks like a great grilling food! I love salsa on almost everything! I never thought about using salsa on hot dogs. Thank you for this recipe. Now that looks delicious! Great way to use up some veggies in the fridge! The hot salsa dog sounds really good. We like to roast them on a stick over the fire in the summer. Summer time means hotdogs! And thanks for the salsa recipe – love the addition of a dash of lime juice.